It looks like I have a new neighbor. I woke up this morning to a big hubbub across the street from my house. I looked out the window to see a guy in pick up truck removing the "For Sale" sign. Later a Local Motion moving truck was parked out front for a total of 15 minutes (who has that little stuff?). I don't think a "Sold" sign was ever posted, so this was a bit of a surprise. But tonight there is a warm glow of lights...and presumably someone trying to figure out which moving box contains the toothpaste, the towels, and the tp. Yesterday when I went out to grab some lunch, there was a guy waiting outside the house. I figured it was someone waiting for their realtor to tour the house. But he was a little more excited than most of the house shoppers I have seen over there. Even though I was all the way across the street, I could tell he was anxious to get inside the house.....he was pacing....looking in the windows.....standing out on the sidewalk and looking up at the house. Then he spotted me and we exchanged "hellos." In hindsight, this had to have been the new owner excited to do his final walk through. This house was flipped. And even though I'm usually not impressed by flippers, I have to admit they did a pretty good job. They moved pretty quick on their work - one day I left for lunch and the house was mint green....when I came home from lunch it was nice, warm brown. It turned out cute. If the house sold for what they were asking, they made a bundle too. The people that owned that house when I moved into mine had....how can I say this.....a few problems. Shortly after buying my house a friend and I were sitting out on my front doorstep. All of a sudden he says "is that gang graffiti on that house across the street that has been partially scrubbed off?" Now I was never able to confirm one way or another, but it wouldn't have surprised me. The police were no strangers to the house and I think the block breathed a collective sigh of relief when the house was finally sold. So, that was today's big excitement at StuccoHouse. Last fall I bought some rather pricey flower bulbs. I spent an entire afternoon carefully planning where they would go and planting them. While I was doing all my digging, my little Evil Squirrel sat on the fence quietly watching me. Moments after I was done and had gone back in the house to clean up, that squirrel dug each and every one of those bulbs up, took a bite out of it and then left them all laying on top of the soil. I was so shocked by the pure evilness of this and all of the time I had wasted, I cried. This year I am older, wiser and much more jaded. I got three bags of tulip bulbs for free (after rebate) from Menards. I went out to my back garden and spent 30 minutes planting about 36 bulbs. I sprayed a little hot pepper wax around the top soil and waited for the Evil Squirrel to do his work. I figured if he missed at least half of them, I was ok. So, it was no surprise yesterday when I was out in my side yard working on pulling down the aluminum that out of the corner of my eye I spotted a pile of bulbs laying on top of the mulch. Damn that squirrel, I thought to myself and went to pick them up. I took them to the backyard to replant them. 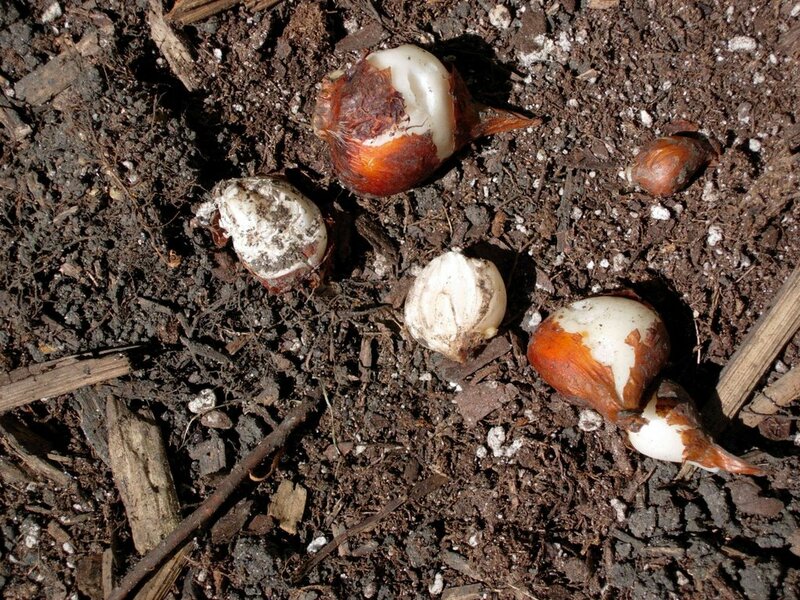 Oddly, none of my planted bulbs had been disturbed - all the soil was untouched. Got bored today while waiting for a second coat of primer to dry on my front door overhang and caulking to dry on my ice delivery door. So, I pulled down the aluminum soffit trim on my built in buffet "bump out." I'm not sure what gets into me that I'm compelled to do these things spur of the moment. As if I didn't have enough projects in the works. 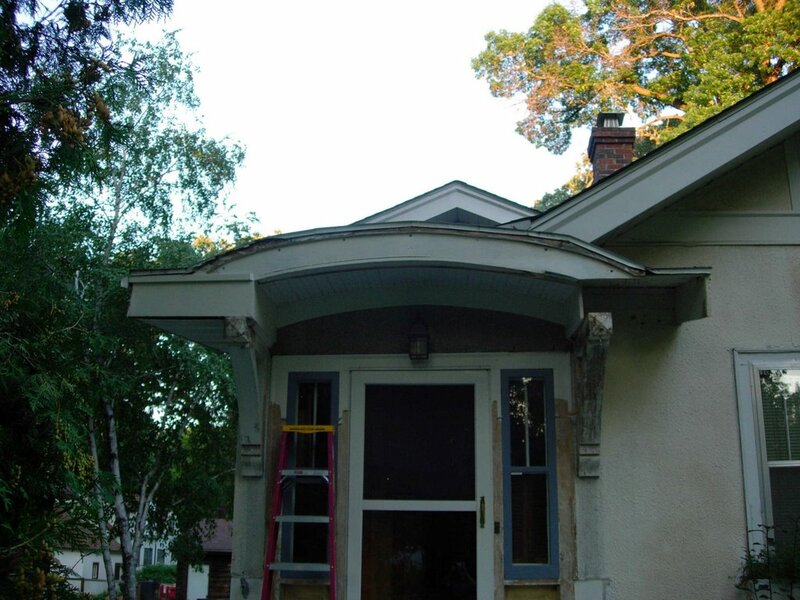 The rafter tails have been cut, the fascia has been replaced with a 1x4, and the paint needs to be stripped, but all-in-all pretty good condition (thank heavens). I never thought I'd say this, but kudos to the guys that put up that aluminum. 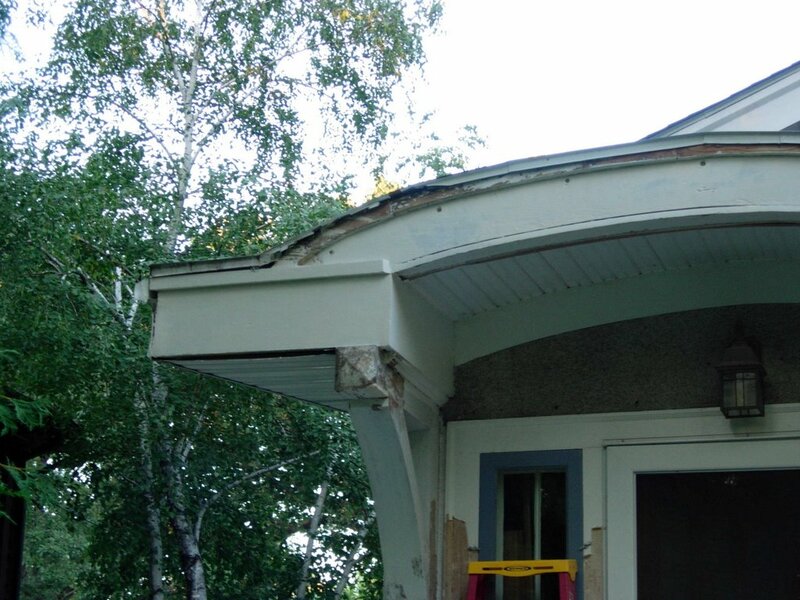 They didn't nail into stucco, they did minimal wood cutting, they did not hack off woodwork to get the aluminum to wrap, they didn't use a zillion nails. Although for the life of me I'll never figure out why they wrapped these houses in aluminum when all they needed was some minor painting. I know it's just my imagination, but it just seems the house can breath better with every piece of aluminum that gets removed. Stripped the paint off of my salvaged wood storm door this afternoon. It dawned on me while working that the handle must have only been a dummy knob to pull the door shut. There is no mortise cut into the side of the door, just a hole cut through the face of the door. Huh. I'll have to do a little more detail work and then it will be ready to prime & paint. 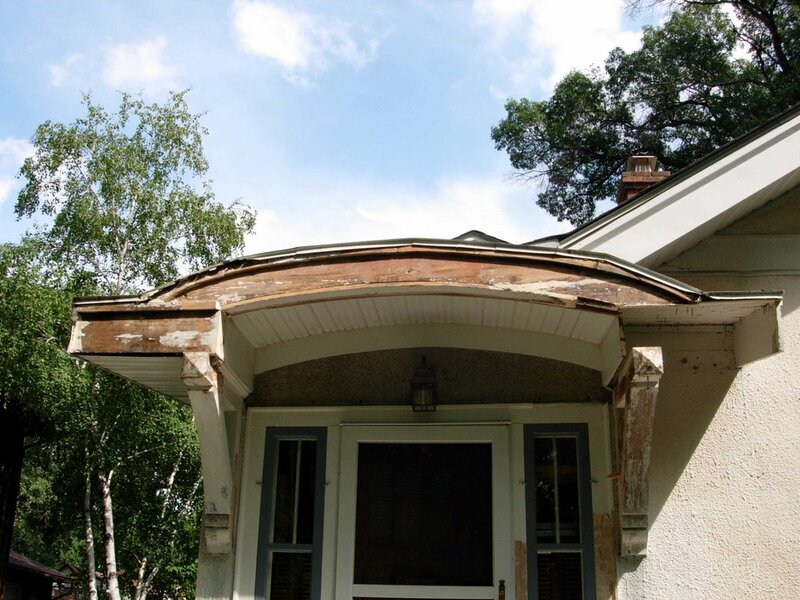 Okay, time to bring you up to speed on my front door overhang project. I am the first to admit that my progress has been slow. My strategy was to break the project down into a series of smaller projects and work through it that way - mostly to keep myself from freaking out. This has resulted in me getting to the primed portion on some sections of the overhang while I am at the epoxy portion on other sections. It may not be the most logical approach, but it does seem to be working ok.
Today we will focus on the left hand corner of the overhang. 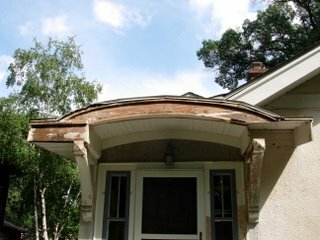 Here is what the overhang looked like covered in aluminum. This photo does not fully capture the crappiness of that aluminum in all of its glory. Here is what the corner looked like immediately after the aluminum was pulled down. Note the little piece of wood that runs vertically underneath the overhang curve on the far right hand side of the photo. This little board was nailed up there to keep the rotted pieces of that board from falling apart. 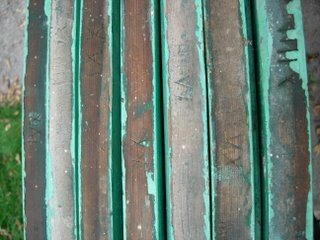 The corners were orignally mitered and sections of wood were being held in place by sheer will and rusty 80 year old nail stubs. There was a moment of "what have I done" when I saw this. 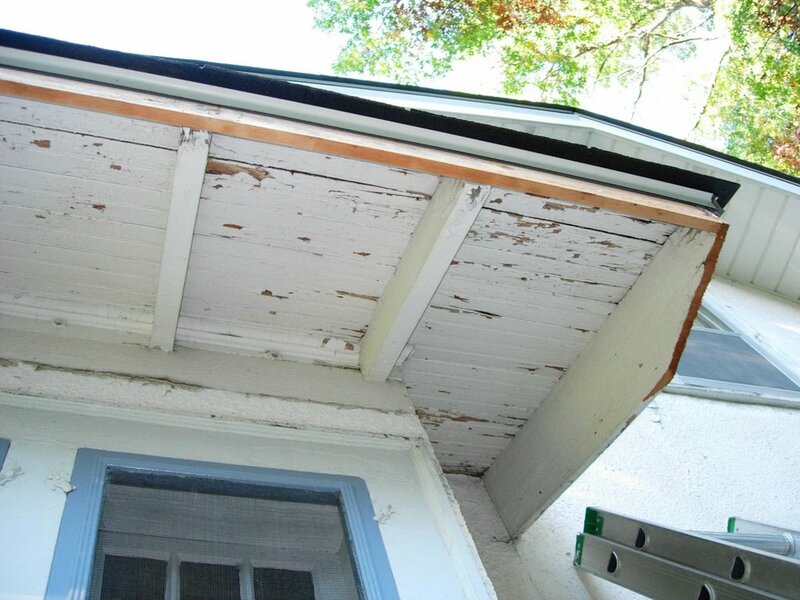 Next, we find the overhang after I stripped off all of the old paint and sanded. 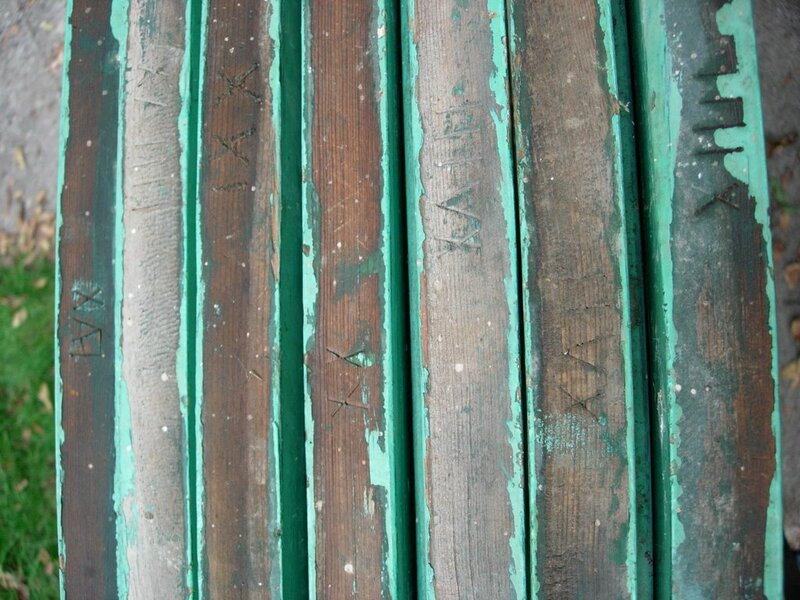 Surprisingly, much of the wood was on okay condition. At this point, the project got a little boring. 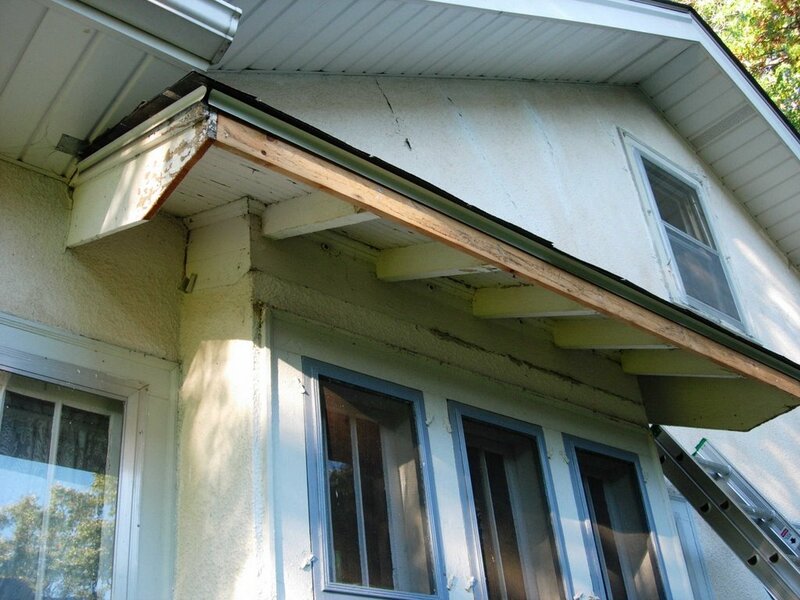 There were a lot of steps, but the overhang changed little in appearance. I put on a coat of LiquidWood on anything that look/felt like rot. In high humidity, this took just under a week to cure. I followed this up with a two coats of BoraCare to address the carpenter ants I saw when I first removed the aluminum. I had to leave this to dry for 48 hours after each coating. 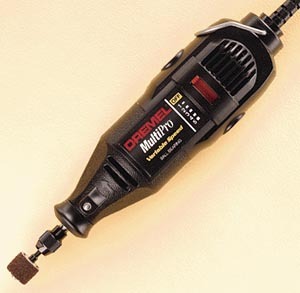 Then I repaired the corner using WoodEpox. 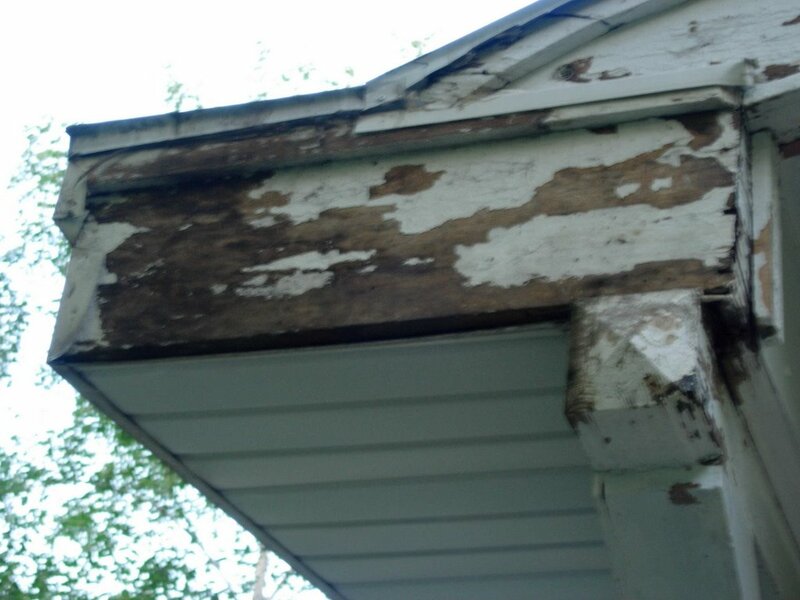 The white portions on the photo are where I used the WoodEpox to rebuild the rotted wood. I sanded the epoxy into shape and then caulked all of the joints. Finally, time to prime. I'm pretty happy (and very surprised) with how it has been turning out. 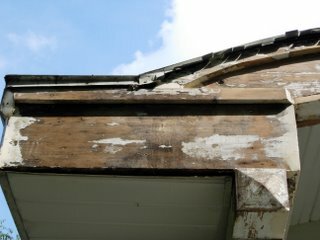 My next update will cover the rebuilding of the quite rotted right hand side bracket and missing fascia board. Once this is done, I can repaint the entire thing (including newly stripped brackets). 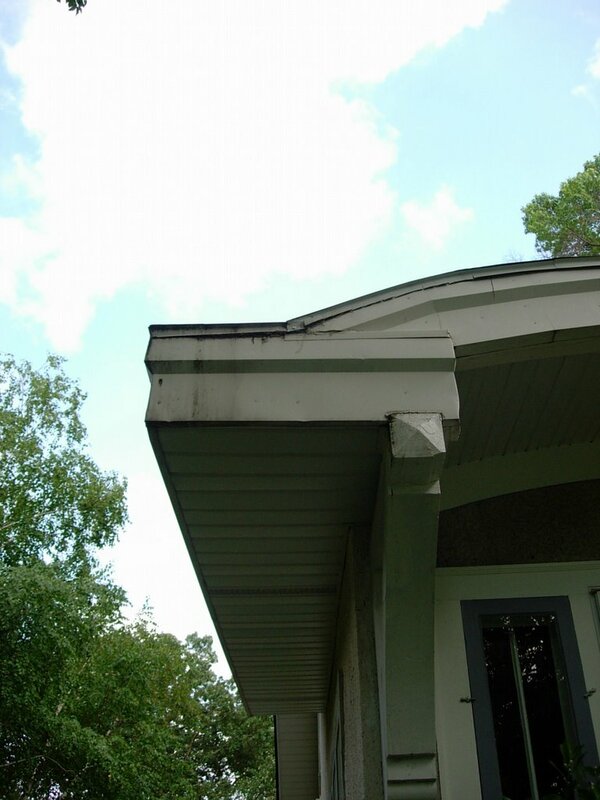 I'm now (somewhat frantically) trying to hunt down someone to pull off the old, ineffective drip edge (don't you love how they snipped it to fit the overhang curve) and install two rows of shingles just on the overhang edge (that part of the roof is membrane). I tried and I'm not strong anough to rip that down by myself and I have no desire to climb up on that part of the roof. None whatsoever. I've put this off for too long and now I've realized I need to hop to it before snow starts falling. Thanks to the folks over 1951 RanchRedo for letting me know that StuccoHouse, along with House in Progress and Slaves to the Vintage House Rehab, received a brief mention in an article on bungalow blogging in today's edition of the Corvallis, Oregon Gazette-Times. 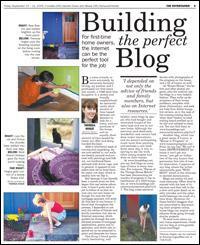 The author recently purchased a 1940's bungalow and talks about looking towards blogs for inspiration. Fun. 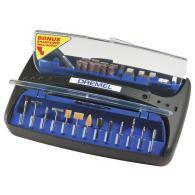 Yesterday afternoon I convinced myself that the *only* way I was going to be able to finish all my ongoing projects was if I had the Dremel Variable Speed MultiPro 395 complete with carrying case and 40 accessories advertised in the paper as on sale for $39.99 at Fleet Farm......along with the Super Rotary 145 Piece Accessory Kit also in it's own carrying case for sale at Fleet Farm for $19.99. If only I had both of them, surely all of my projects would get done. This past weekend I went to our neighborhood picnic. After a few false starts, I now really enjoy visiting with the neighbors. I had to laugh because as I entered my neighbor's backyard across the street, there was a group of the neighborhood men already sitting in lawn chairs talking. One of those guys periodically stops over to kid me about my slow progress. As I walked into the back yard, he says "Hey, StuccoHouse (well, he knows my real name) how's that project coming?!" He then laughed a little and waited for my witty response. He was referring to my front door overhang project and I had to laugh a little too, because it is plugging along at a rather slow rate. I responded "Didn't you see that I primed the whole thing this week just so my project wouldn't be the topic of conversation at the picnic?" It turns out a few more people on the block have been tracking my progress than I thought.....and I did prime it just for the picnic. At the picnic I chatted with one of the women that lives in a bungalow across the street from me. We were talking about starting a little house project only to be standing in horror when you realize you opened a can of worms. 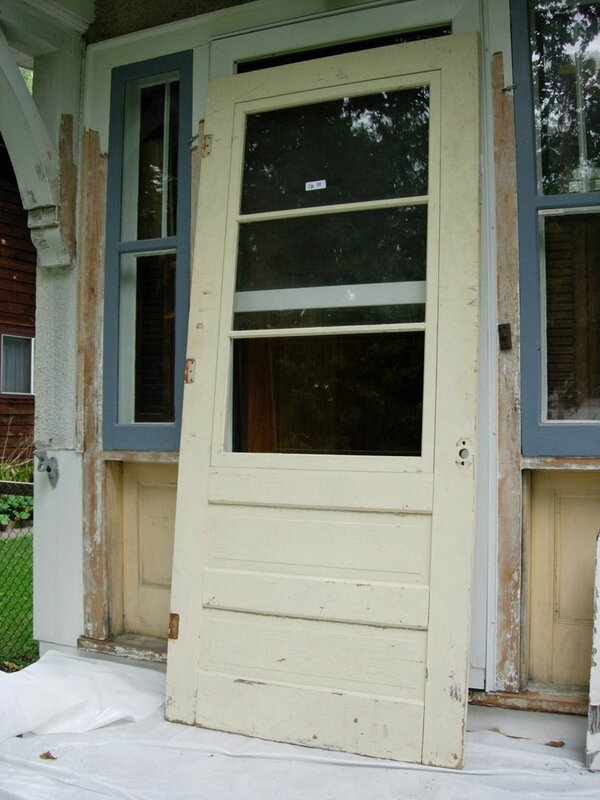 I mentioned that I was trying to figure out what to do about my front storm door....and that I really wanted an old style wood one. (Long story short - the current door is yucky and pre-hung. As I strip the front door trim paint, I run into the frame of the pre-hung door. 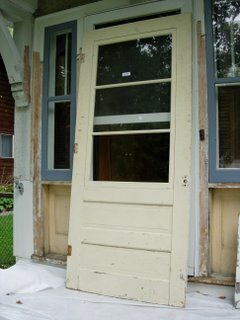 So, either I have to strip only part of the paint or I need to get a new storm door.) I have been shopping for them this summer and have bids ranging from $265 to $800 - not including hardware or installation. She pointed to the wood door on her house (exactly what I am looking for) and told me they had picked it up at a salvage place, The ReUse Center, that I frequent. I couldn't believe it. I have been stopping by that place on a weekly basis all summer long with my little measurement card going through all of the old screen windows, storm windows and storm doors. I have never seen anything even close. So today, armed with the new found faith that salvaged, wood storm doors were not just an urban legend, I stopped back at the ReUse Center during my lunch hour. I was joking with another customer in the door section about how we both knew the exact door we were looking for was in the piles, we just couldn't get at it because the place was so disorganized. I was still chuckling about this when I saw it. 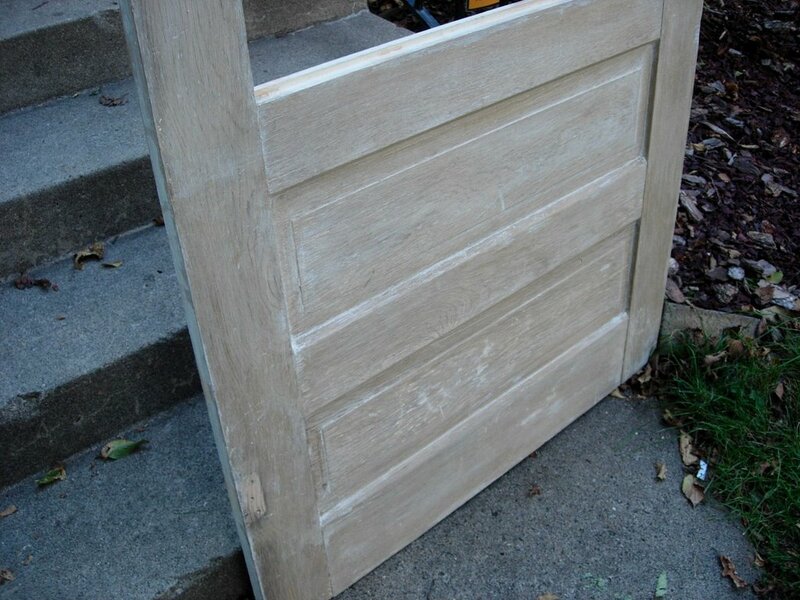 My salvaged, wood storm door. 36" x 81" (my door is 35" x 80"). One coat of peeling paint. $25. I can get this stripped down and repainted pretty quickly. I'll fill the old hardware hole with wood epoxy (my new best friend). Suggestions on how to cut this down? Or is this where I call a door installer to put the thing in correctly? Look what I scored today. I am pleased as punch. I was driving down the street and spotted some old windows being replaced in a house on the left hand side of the street. I was thinking to myself what a shame that was and was making a mental note to stop back tomorrow and see if they had any old storms or wavy glass being thrown out. All of a sudden I noticed a garage sale on the right hand side of the street. They had a set of screen windows propped up by a tree. I pulled over and took measurements. I raced home to get my little card with all of my window measurements (I usually carry this with me, but cleaned out my purse yesterday) on the off chance they would fit some of my windows. 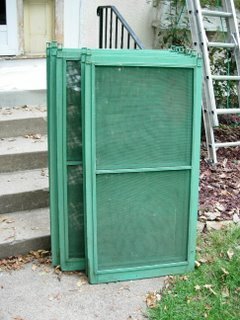 I have been looking for salvaged screens & storms for my windows for over 2 years. Anyone that tells you old house windows come in standard sizes is smoking something. While I was writing out my check, I got to chatting with the two women that were running the garage sale. They were so nice. Turns out the woman that owned the bungalow was moving to Florida. Her family had built the house we were in front of and also the one next door. She had lived there all of her life. She told me a very cute story about the tree in her front yard, that I will post about another day (I have her permission, but I need to go back and get a photo). 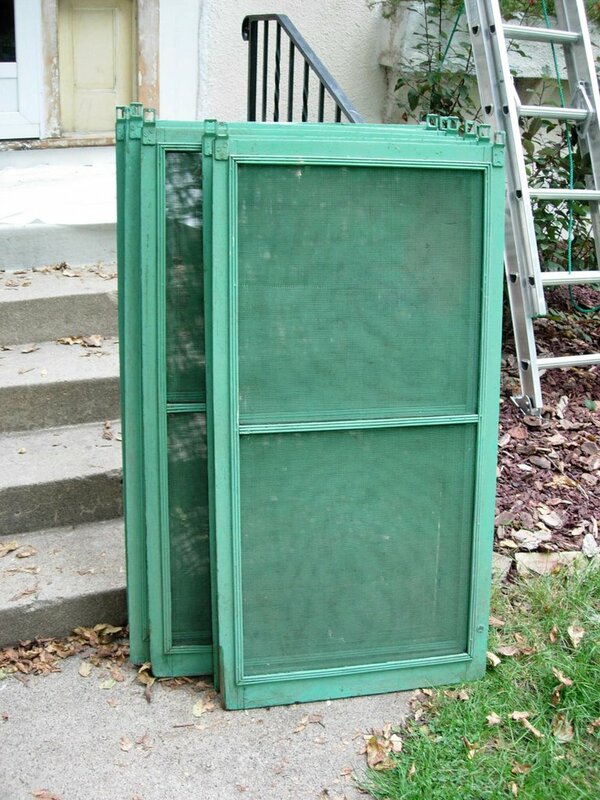 I told her I was restoring my house using old parts and was really excited to get her screens. I also mentioned that she should write down some of the stories she remembers for the next owners of her house. How fun would it be to buy a house and get stories of the house from the original owner?! She is going to talk to her husband to see if they have any of the old storm windows (be still my heart). This is so not the post I wanted to be writing today. Wednesday I went downstairs and smelled something musty. I did a little investigating and discovered a pool of water surrounding my main plumbing stack. 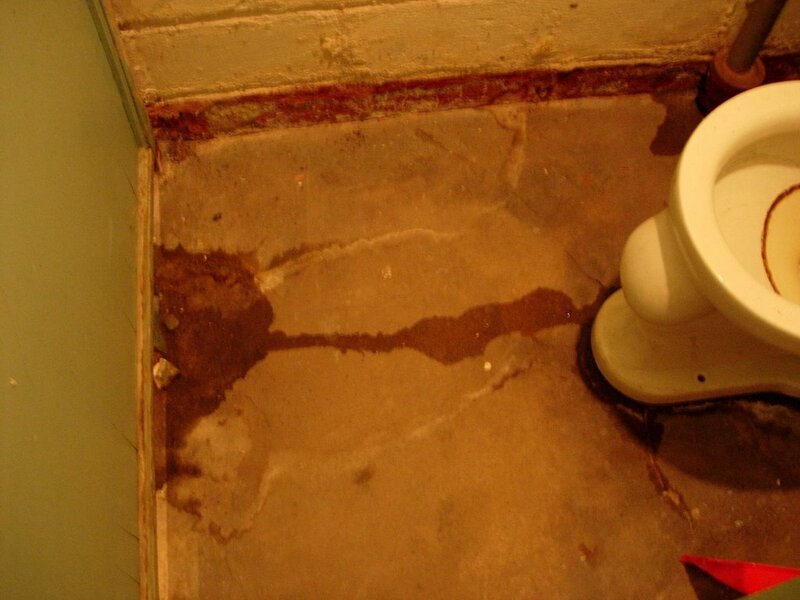 I opened the door to my little toilet stall and noticed water standing in the area too. The main sewer line runs under this area too. Damn. So, Thursday I called my plumber (it is never a good sign when you can say "my" plumber). He arrived at the house promptly (also not a good sign when you are considered a VIP customer due to all the business you have generated). After surveying the situation, his guess was the sewer line was blocked and putting pressure on the toilet causing the seal to leak. It has been two years since I had the sewer cleaned out. It is old and ocassionally gets slowed down by roots. At this point I was also forced to admit a little fact that I have been in complete denial about. There is a small sink hole out in my front yard. I rationalized that it was a wasps nest. and certainly not a clue of a bad sewer line. Let's just ignore that is it suspiciously in line with the sewer. The plumber agreed that this did not look good. This could mean that I would need a new sewer line. A $4,000 to $6,000 job. I felt sick to my stomach. He must have noticed that I was turning a little green (omg, where am I gonna get that money on short notice?!!!) and told me we shouldn't jump to conclusions. We decided to get the sewer cleaning guy out to look at it. The Sewer Guy arrived shortly. He went down to my basemenet and dug up my sewer access pipe (yes, I said dug up). It is very old. 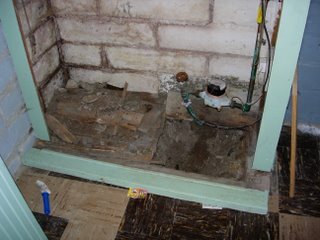 He turned on water, he flushed toilets, he ran and looked in the pipe, he flushed more toilets, he turned on more faucets. Much to my relief, he then told me my sewer was not blocked in the least. It was fine. Hallelujah! 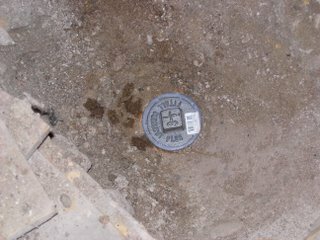 He did offer to replace the deteriorated sewer pipe cap for me. Turns out sometimes a sink hole is just a wasps nest and water on the basement floor is just a leaky toilet. So, in the end I have a new sewer pipe cover. A moment of silence, please, while we admire it. When I first moved into my house, it dawned on me that using a 1924 wood cutting board was kind of disgusting. Who had cut what on that board over all of those years? So, I pulled out my undercabinet board and brought it to my basement workshop (I use that term loosely). I used a bleach solution to kill any germs. Then I sanded the board down smooth. It actually looked almost new. As the final step I loaded it up with food grade mineral oil. I let the oil sink in for a few weeks. Pretty typical cutting board maintenance. But, then I made my fateful error. I brought the board back upstairs to the kitchen and slid it back into its little undercabinet slot. 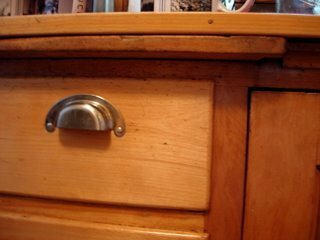 The oil in the wood must have continued to expand the wood and now I can't pull out that cutting board for the life of me. I have tried everything I can think of. I've pulled. I've wiggled. I've tried to free it from the shelf area underneath it. I've solicited guests to my house, stronger than me, to try. It wiggles a bit. It does not pull out. Of course the minute you do not have your handy little pull out cutting board, it is the only thing in the kitchen that you need.